Heart of Winter is pleasantly surprising me with the quality of the content. I expected a high-level hack and slash fest, but the parts I’m going through have great writing, great voice acting, tough combat and interesting puzzles. It’s the whole package. I absolutely love the voice acting for the barbarians, especially their king, Wylfdene. I can’t stress enough how much I enjoyed listening to the conversations. The basis for the plot is also interesting and not at all the cliché “an evil spirit takes over a dead king’s body” story I expected. Pictured: Upon entering the barbarian camp, you are surrounded and taken to the king. Though the Icewind Dale was often described as the more combat-heavy, less talk-oriented brother of Baldur’s Gate, credit should be given. For instance, the diplomacy session with the barbarians upon first visiting their camp near Lonelywood was worth almost an entire level of experience for four of my characters, without ever casting a spell or swinging a sword. What’s even better, parts of it were optional, or at least not completely automatic, so it was exploration of options that was rewarded here. Pictured: The first and unprepared for fight on the Burial Island. 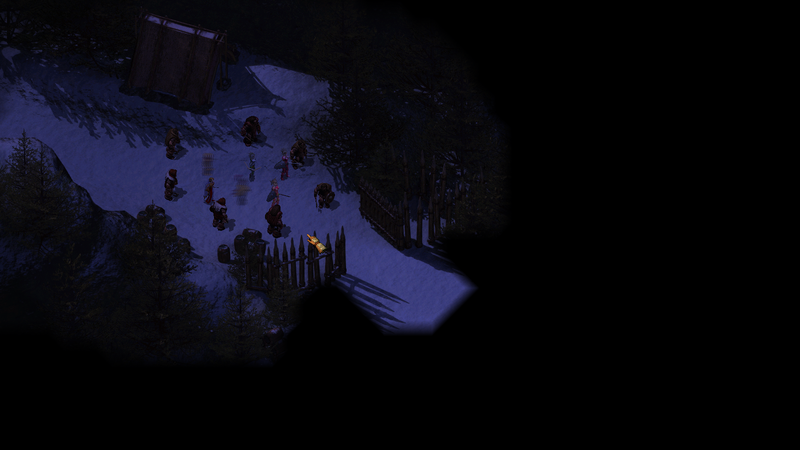 As usual, Rax almost got killed, so everyone scattered trying to keep her alive. Alana is being MVP with Turn Undead. I can’t claim this is objectively true, but it feels like the design in general is different compared to the base Icewind Dale game. The optional quests aren’t as in your face as I’m used to. For instance, there’s a whole side-story in Lonelywood that you stumble into and can completely miss big chunks off if you don’t ask around town about it. Back in the base game, you would almost explicitly be told that there’s an optional quest in it for you. It just feels like everything is designed with more detail. It feels somehow truer. On the quest of dealing with the barbarians, I went through an area called Gloomfrost, which was different, to say the least. Throughout the place, I was being watched by giant eyes appearing in the walls and cliffs, belonging to the seer I needed to find and talk to. forged a powerful weapon out of ice. I was able to decide on the type of weapon among several choices. I went with a mace. reforged his shield, which I found somewhere along the way. He made it stronger. reforged the sword I got in Easthaven, the Blade of Aihonen. had him make me a rose made out of ice, for someone in Lonelywood. had him tell me what to do to reach the seer. I guess he isn’t an optional character then. 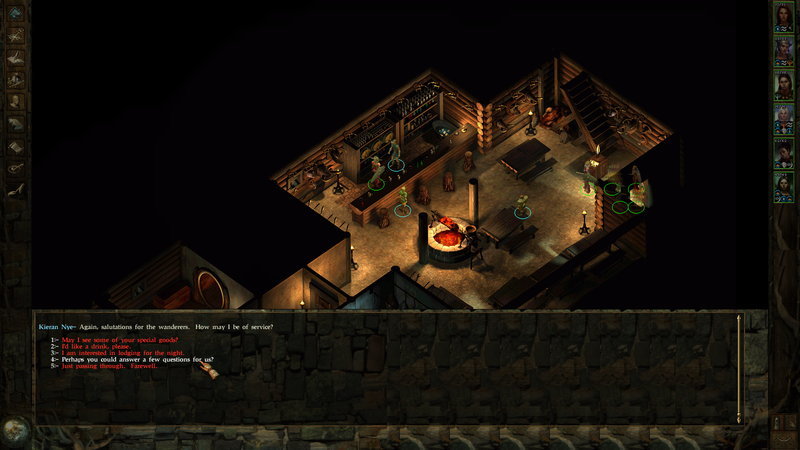 Here you can see the party standing in Tiernon’s forge. I just sold some of my stuff to him. He’s a merchant to! Another thing I noticed that I’m not sure if I like was that the game quickly got the “you’re close to the end” vibe, so I started questioning my decisions. Should I do this quest, or should I go back and see if I missed anything? Will I completely miss this part if I advance now? I don’t think that’s inherently bad or good, but it adds a degree of uncertainty that I guess I’m not comfortable with. I don’t like leaving loose ends. 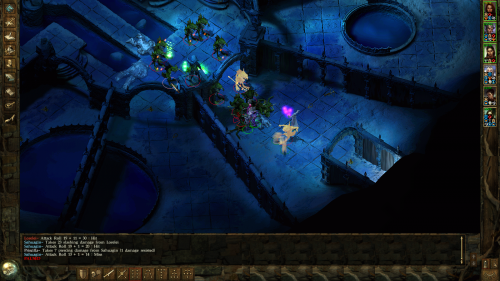 After clearing Gloomfrost and revealing who Wylfdene really is, I was fighting trolls and similar creatures again, on an island. Though my increase in power is very noticeable, even the toughest characters can still die easily if you’re not careful, so exploration continued to be slow and methodical. 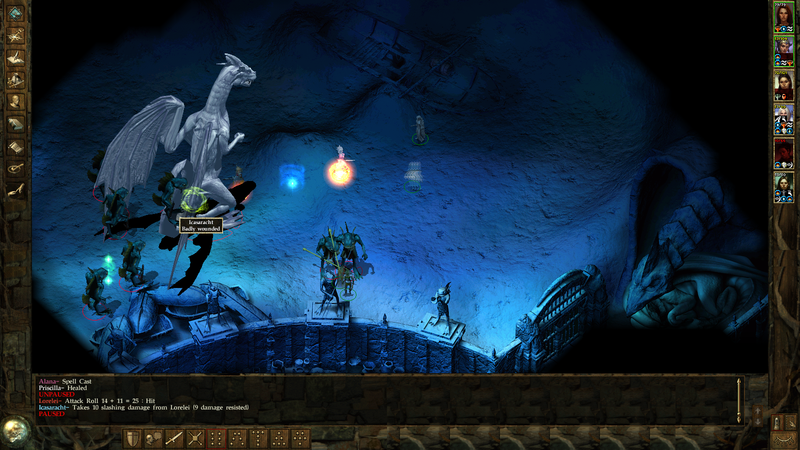 Pictured: Alana and Aleen casting their usual spells, Recitation and Haste, on my three main combatants. Rax is just coming back from stealthed exploration of the northwest. My worries ended up being justified. This island was the last place I’d visit. There was a short exploration of the surface, after which I entered a cave, went a level or two deeper and was soon able to fight the boss. Before the boss, there was a massive battle in two parts, which rewarded me with some items, I guess just in case I didn’t get anything good up to this point. Mostly, I got weapons. Pictured: The first half of the massive fight before the final boss. There are still just as many enemies to the northwest. The boss was a dragon. 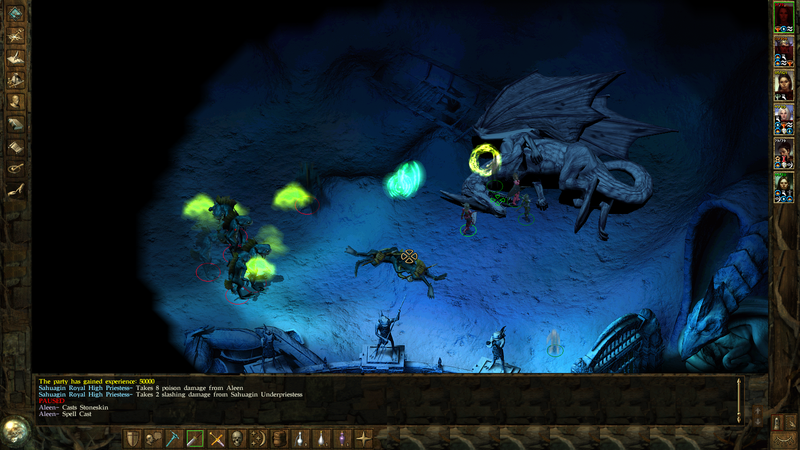 In Dungeons and Dragons, dragons hit hard and cast spells. This one was a frost dragon and as usual, I wasn’t prepared. I only had a single Scroll of Frost Protection on me and I didn’t even bother to memorize the proper spells. Luckily, there was a healer in the previous area, so I was at least able to rest and cast Aid on everyone before the fight. Aid, Haste, the highest level chant, all the potions I could muster and a lot of luck was still barely enough to beat him. Pictured: A completely healthy dragon and big trouble for my party. In the end, I had to kite the dragon around with whatever character it was targeting, trying to heal this character with Alana at the same time and hitting it in the back with my other two fighters. Meanwhile, Aleen was casting every possible crowd control spell at the large group of minions the dragon had with it. 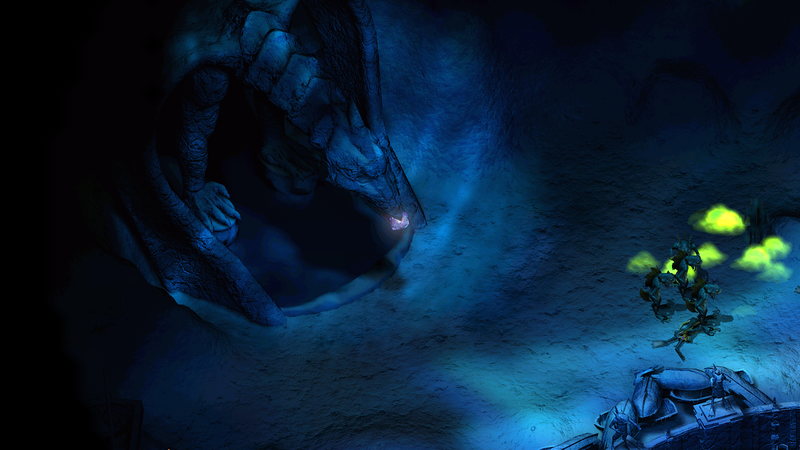 Pictured: A dead dragon. Everyone is somehow still alive at this point, but there remain minions to be killed. At the moment of death, everyone was still alive, just barely. 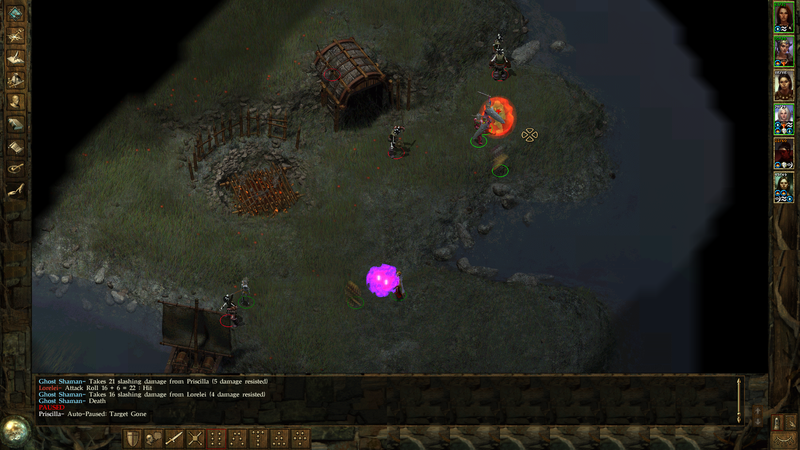 However, there was one more extra enemy to kill and this one was able to cast mind control spells. It confused all three of my fighters so they ended up killing each other. In the end, only Lorelei remained alive. I was able to resurrect Priscilla with Alana, but I couldn’t rest in the area, so I ended up completing the game (watching the final sequence) with Robin dead. Officially, it was a bittersweet ending. Unofficially, I went back in and resurrected Robin after it was done. Pictured: The extra “enemy” after the final boss. It can still kill you if you’re not being smart. On a side note, I think I’ll be multi-classing rogues every chance I get from now on, unless there’s a really good reason not to. Rax was useless in most fights. Even now, against the final boss, she was just hiding in the background, as getting into melee range of anything would mean hear death within seconds. I basically won the game with five characters. In hindsight, I should have given her a ranged weapon, but then she’d just be slightly less useless. Oh, and I never did find out the complete truth about the murders. Eventually, all three of the trapper brothers got killed and the local ranger disappeared, so my theory is that the wolf that bit him in the forest inflicted him with lycanthrophy. After that, he killed the brothers one by one. I even fought the werewolf at one point, but it ran off once I hurt it enough. And that’s it. After the final animated sequence, which again had no audio for some reason, I was thrown back out to the main menu. I can’t believe it, but I’ve completed Icewind Dale. 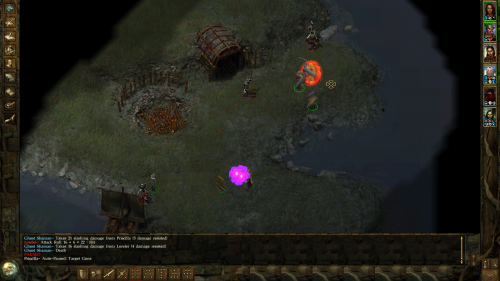 This is only the second Infinity Engine game I have ever completed, with the original Baldur’s Gate being the first. For some reason, I abandoned and restarted these games often as a kid. Don’t ask me why. 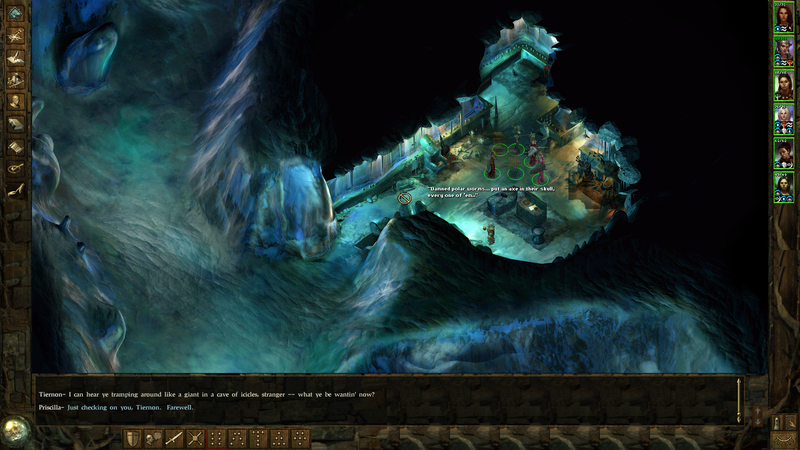 In any case, Icewind Dale was great! 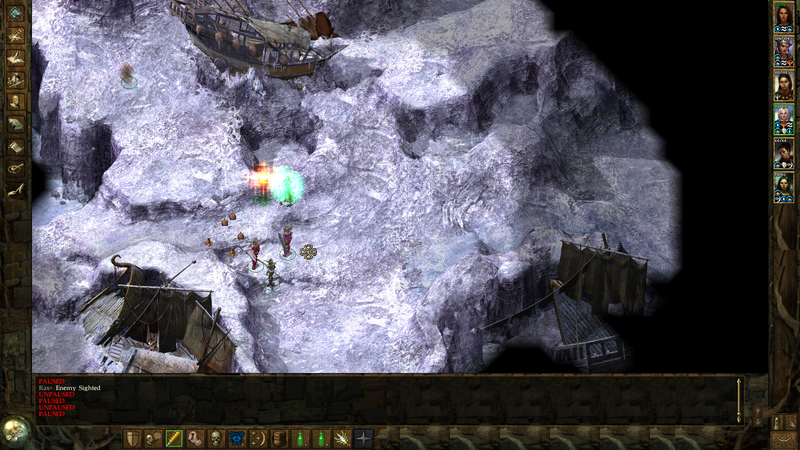 It definitely is more combat-focused than Baldur’s Gate, but that doesn’t mean the story is in any way bad. It’s masterfully told, the voice acting and atmosphere are amazing and overall it was an extremely pleasant experience.